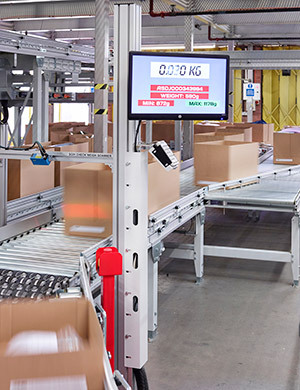 Axiom GB has designed and completed an automated packing and dispatch solution for Asda Stores Ltd at Clipper Logistics’ Boughton facility in Nottinghamshire. The new system has enabled Asda to double its order throughput of its online George.com homeware merchandise without increasing the footprint of the original manual operation. It was the continued expansion of the Asda homeware e-commerce business which prompted the decision to automate the packing and dispatch process. Nathan Bower, Senior Manager for Asda Stores Ltd was instrumental in selecting a partner for the project. Bower explains, “We’re always looking for ways to better serve our customers and expand our offer to make sure more customers across the UK can take advantage of our everyday low prices. There were a number of factors we had to take into consideration when choosing a partner for this project and we’re pleased with the final solution as it benefits our customers greatly. The Asda homeware business operates over three floors on the Clipper site. 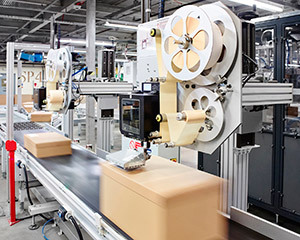 The automated process begins on the bottom floor where three different sized boxes are produced and then loaded onto a conveyor, travelling directly to the operatives in the picking areas located on the third and ground floors. Pickers sign into the warehouse management system which gives them a group of orders in priority and the size of box required for each pick. Each box is then assigned a unique label which is scanned at various stages throughout the packing process. Axiom has designed the software for the automated system using a combination of standard software for conveyor and automation control, integration and business logic software for the Manhattan interfaces and MetaPack for dynamic label generation. Once each order has been picked all the filled boxes travel by conveyor through the checkweigh section on the ground floor to ensure pick accuracy. The next stop is quality control where the boxes are checked to see if additional void fill or protective packaging is required. They are then placed back onto a conveyor to be taken automatically to the lidding area. There are two B+ lidding machines, one catering for the larger boxes and one for the smaller ones. Each machine measures the highest point of the goods inside every box and then scores and folds down the sides of the box to make it a bespoke size. Finally a lid is glued on and the box continues its journey along a conveyor to the two labelling machines. Integration between MetaPack and Axiom software ensures that the correct label is applied to each box as the two labelling machines work in tandem to process the swiftly moving boxes. All online purchases are either delivered to a customer’s home address or they are Click and Collect orders which are sent to the customer’s nearest store. The boxes destined for home delivery travel by conveyor and are then boom loaded directly into the trailers waiting in the loading bays. Those marked for Click and Collect travel through to a final sortation process where a sorter allocates the packages into chutes representing ASDA’s eleven regional depots. Once there the packages are sent to individual stores for collection. “We worked closely with Axiom to finish the project within the tight deadlines we needed to meet,” concludes Bower. “Because it’s a relatively small company the senior team at Axiom is very accessible - you deal with the same directors from tender through to design, installation and commissioning. They completely owned the project end to end.